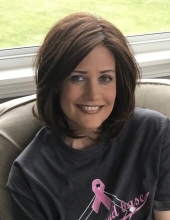 Monique M. Sindt, age 54, a resident of Plainfield, IL, passed away peacefully after a courageous battle with breast cancer on January 28, 2019 at the Joliet Area Community Hospice Home. She was born in Oak Lawn, IL on July 26, 1964. Monique was preceded in death by her loving parents, Dennis and Carol Sindt. She is survived by her dear siblings, Dale Sindt of Bonita Springs, FL and Wednesday (Ronald) Tucker of Plainfield, IL; her cherished aunts, Donna Marie (Roger) Klocek of Plainfield, IL, Sue (Tom) Hoffmeister of Kouts, IN and her uncle, James (Cathy) Sindt of San Antonio, TX; her cousins, Daria Klocek, Alec Klocek, Dawn (Mike) Nogajewski, Tim Hoffmeister, Karyn Sindt and Christy Sindt; as well as a host of great friends. Visitation will be Friday, February 1, 9:00 AM until the time of funeral services at 12:00 Noon at the Overman-Jones Funeral Home & Cremation Services, corner of Routes 30 & 59, Plainfield. Interment will be private. To send flowers or a remembrance gift to the family of Monique M. Sindt, please visit our Tribute Store. "Email Address" would like to share the life celebration of Monique M. Sindt. Click on the "link" to go to share a favorite memory or leave a condolence message for the family.